Tokyo, Japan, January 22, 2013 — NSK Ltd. (NSK; Headquarters: Tokyo, Japan; President and CEO: Norio Otsuka) announced today that it has developed a fretting*1 resistant bearing for use in motors used in throttles and exhaust gas recirculation systems. NSK is increasing the sales of this product in the expanding automobile motor market and targeting 800 million yen a year in global sales in 2015. *1 Fretting: Wear that occurs when bearings are used in environments where the bearing is subjected to continuous microfluctuation and vibration, which causes the ball to rub against the raceway surface. In recent years it has become an urgent matter to reduce harmful emissions and improve the fuel economy of automobiles in order to improve the environment. As a result, the application of various motors in automobiles has been expanded in order to realize greater efficiency and control precision. In particular, the application of motors has increased in exhaust gas recirculation systems and electronic throttles designed to reduce the amount of nitrogen oxide in exhaust gas. However, bearings used in such locations are subjected to vibration from the engine and microfluctuations due to continuous forward and reverse movement. For NSK, this has presented a challenge and an opportunity to improve fretting resistance performance. In response, NSK has developed a bearing that suppresses fretting through the application of a newly developed grease and NSK’s design technology to optimize the internal design. 1. Improved reliability by suppressing fretting. In optimizing the grease properties, NSK has made it easier for the grease to flow into the raceway surface. 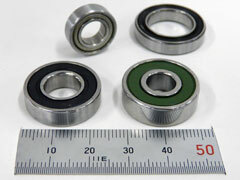 As a result, even when the bearing is subjected to severe conditions that lead to continuous micro-rotation due to fluctuation and vibration, the oil coating is maintained, thereby reducing the damage to the bearing raceway surface by half of that of the current bearing, providing improved reliability. The basic performance, such as friction loss and seizure life, is equivalent to or greater than that of the current bearing. The product improves reliability of the motors used in exhaust gas recirculation systems and throttles in automobiles.